There's no reason to put up with gaps in your teeth or with teeth that are stained, discolored, badly shaped, chipped, or crooked. Today, a veneer placed on top of your teeth can correct nature's mistakes or the results of an injury and help you have a beautiful smile. Veneers are a highly popular solution among dental patients because of their realistic tooth appearance. Veneers are thin, custom-made shells crafted of tooth-colored materials (most commonly porcelain) designed to cover the front side of your teeth. Initially, the dentist will remove a small amount of your tooth to make room for the veneer. Then an impression of the teeth is made. This impression is sent to a dental lab where a technician makes a precise model of the prepared teeth and, upon this model, creates the veneers. After the impression is made, the dentist will place temporary veneers on your teeth. At the following appointment, the dentist will remove the temporaries and try in each of the veneers to determine the accuracy of their fit and their overall cosmetic appeal. 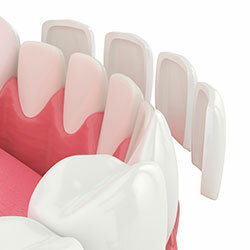 Each veneer is then bonded (adhered) to its respective tooth. When placed, you'll be pleased to see that veneers look like your natural teeth and even resist staining. Though veneers are stain resistant, your dentist may recommend that you avoid coffee, tea, red wine, and tobacco in order to maintain the beauty of your veneers.